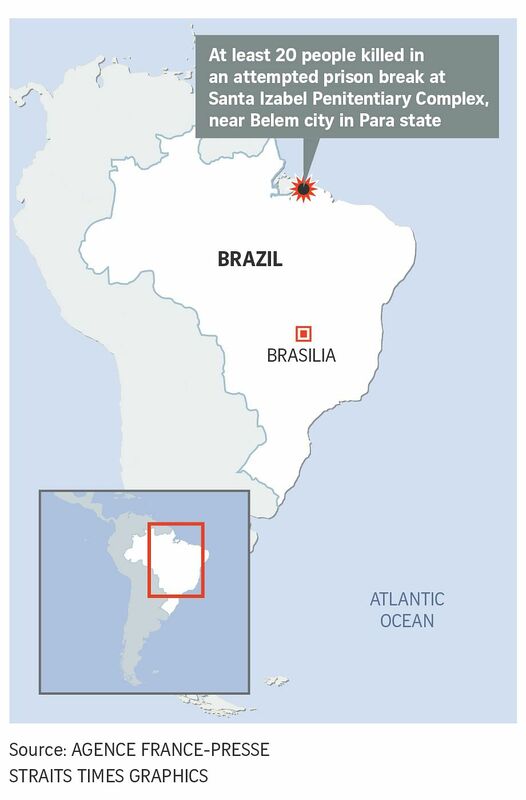 RIO DE JANEIRO (AFP) - At least 21 people died on Tuesday (April 10) in an attempted breakout from a prison in northern Brazil aided by an armed group on the outside trying to blow up a wall, officials said. Prison guards fought back in "an intense exchange of gunfire", it said. The confirmed dead so far included 20 prisoners and outside attackers, and one guard. Another five guards were injured, including one seriously, the statement said. A headcount was now underway in the prison to establish if anyone succeeding in escaping, while a police SWAT team had arrived to reinforce security. Brazil is one of the world's most deadly countries, with around 60,000 homicides a year, and the prisons are notoriously overcrowded and violent. There were 726,712 inmates as of June 2016 and capacity for only 368,000, according to the most recent official statistics. Powerful drug gangs routinely take their turf wars from the streets of Rio de Janeiro and other big cities into penitentiary facilities. In the worst cases, security staff are reduced to bystanders as the criminal bosses run daily life. In one of the most bloody episodes, 56 people were killed in an uprising in a prison in the city of Manaus in Brazil's Amazon in 2017. In January, fighting between gangs at a prison in the northeastern Ceara state left 10 dead. The bloodshed took place in the Itapaje Public Prison, about 125 kilometres from the state capital, Fortaleza. A few days earlier, at least 14 people had been gunned down at a nightclub in Fortaleza. Local media reported that the massacre, conducted by armed men who arrived in three cars, was related to disputes between rival drug traffickers. Adding to Brazil's security woes, the police force is regularly accused of breaking the law in carrying out extrajudicial killings, falsifying evidence and failing to investigate its own officers. Human Rights Watch reported earlier this month that police had killed 4,224 people in 2016 - the last available figures - which was about 26 per cent more than in 2015. The streets are also deadly for police: 437 were killed in 2016, the report said.